The Matador is riddled with plot holes and morality gaps, but it nevertheless survives on its charisma and willpower. An unforgettable performance by Pierce Brosnan doesn’t hurt, either. The Matador is not the first film from writer/director Richard Shepard (The Linguini Incident, 1991), but it feels like a first film. Sets are simple and simplistic. The plot and characters lack subtlety and sophistication. Music and setups seem to be borrowed wholesale from the action/adventure movies that young, aspiring male directors thrive on. Even the plot seems to borrow heavily from the movie tastes of young men: We open on an assassin, Julian (Brosnan), blowing up a Porsche (with Colorado plates! ), but not before a little humor playing with the cool anonymity of movie spies. A kid comes up to our hero and asks why he’s been staring at that car over there. Our sophisticated killer resorts to childish name-calling before storming off in a huff. Our assassin meets our protagonist Danny (Greg Kinnear) in hotel bar in Mexico City. The killer has finally lost his nerve and he’s ready to hit the bottle since he couldn’t hit his target. Danny is drinking to celebrate a big business deal, and he’s eager to open up to any American who’ll share a margarita with him. After a rough start smoothed by alcohol, these two unlikely amigos head straight for “awkward” territory, with Danny talking about the death of his son and Julian trying desperately to change the subject by telling a tasteless “Mexican walks into a cantina” joke. Julian, obviously, has very unpolished social skills. Eventually, Julian decides he really needs a friend to help him through his mid-life crisis, so he invites Danny to the bullfights. (In the credits, the filmmakers have it both ways; they “do not condone” bullfighting, but acknowledge its cultural significance.) Danny asks what Julian does for a living and Julian simply tells him the truth: he’s an assassin. Danny can’t believe it. Picking a dapper Don at random from the crowd, he asks how Julian would kill him, right now, if money was no object. Julian obliges, distracting the security team, planning an escape route, pulling a knife, and nearly scaring the Don (and Danny) to death in a bathroom stall. The two then have an awkward lunch together. Julian, desperate, asks Danny for some help on his next job, and Danny flatly refuses, curious though he may be about how assassination works. They leave Mexico to go their separate ways imagining they’ve seen the last of each other. But all this has only been the first act. The two meet again when Julian shows up at Danny’s happy suburban Denver home. As exciting as it is to have a real assassin in your home (Danny’s wife, played by Hope Davis, wants to see his gun), Julian is still a social sophomore, and their pleasant late-night visit is tinged with desperation, condescension, and a hint of menace. Whenever the missus is out of the room Julian tries to convince Danny to help him with one last job, after which he can retire. If he doesn’t do it, “they” will kill Julian. The movie continues from there. There is a pleasant surprise that shows that although The Matador may look like a rookie movie, Shepard has at least learned a few tricks of the trade. That’s a lot of explanation, but really, the movie boils down to one thing: Pierce Brosnan as Julian. Although the character isn’t realistic — he feels like sitcom character, or maybe a cross between De Niro’s neurotic killer from Analyze This and Carrey’s desperate loser from The Cable Guy — he is well represented by Brosnan. (I was going to say “fleshed out by Brosnan” but that implies too human a performance, whereas Julian is more of a cartoon). Julian is so lacking in social skills that you almost feel sorry for him — except that he is so lacking in social skills that it’s nearly impossible to like him. 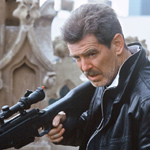 Brosnan walks a fine line between sympathy and repulsion, which is exactly what the role — and the movie — call for. Unfortunately, to make it work, the character of Danny has to be just enough of a pushover to be bullied by someone like Julian. Again, the casting saves the day. Kinnear is a perfect patsy. He’s De Niro’s Billy Crystal. He’s Carrey’s Matthew Broderick. He’s just gullible enough, just enough of a naif to fall under Julian’s half-baked spell. In the end, The Matador isn’t a masterpiece. But it’s enough of a laugh to keep you entertained for 96 minutes.